Diamine fountain pen ink comes in an 80 ml bottle in an assortment of colors. The Diamine company has been making fountain pen ink since 1864 producing the finest quality inks. The Diamine Bottled Ink(80ml) Fountain Pen Ink usually ships within 1 business day unless otherwise specified. Each Diamine Bottled Ink(80ml) Fountain Pen Ink we sell is guaranteed to be genuine, authentic and will arrive brand new & unused! Avery nice, dark blue ink suitable for work. My go-to blue inks for work are this Diamine Oxford Blue and Majestic Blue. They are rich, dark blues that don't raise eyebrows on documents. This is a lovely color. I like Diamine inks and have found them to be of a very high quality. I am delighted with this new ink. The colour is perfect and exactly what I was looking for. I will order more colours in the future and I believe you may have a customer for life. Thank you so much. Diamine Marine is a pleasant aqua hue, more greenish when compared to something like Noodler's Navajo Turquoise. I'm using it in a Monteverde Giant Sequoia pen with a 1.1mm stub nib, and in this situation it is rather dry with little shading, and I don't believe you will get any sheen out of it. I believe that with a finer, wetter nib you will be able to get some decent shading. Anyway, I do like this ink along with the other Monteverde colors I've tried so far. One of the nicest brown inks I have ever used. Brown is my signature color as is the use of a fountain pen. The Diamine Teal ink has met and exceeded my expectations! Got various colors of Diamine ink in. So far all have been top drawer with minimal feathering on very cheap papers. I bought the 80 ml bottles of Grey and Pumpkin. The grey is my first grey ever. Didn't like it at first but it's growing on me slowly and surely. I've filled it in a fine nibbed pen and will progress to a medium nibbed one soon. Beginning to like it on fine and I think it'll look good with the medium too. Pumpkin on the other hand is just plain brilliant!! Very bright color, in-your-face. Have this in a medium nibbed pen but want to see it in a fine nibbed one. both have excellent flow and dry quickly enough for my use. Not much shading that I noticed in either ink. I suspect the grey does shade a bit but I cant make out for sure with the fine nib I'm using right now. I purchased the Marine color ink. It is super wet flowing, and a thin watery ink. The color is great - a turquoise with a hint of green. The ink is easy to clean out of pens, though sticks to skin a bit. The 80ml bottle is pretty good, with a wide opening and decent shape for filling. The ink tends to bleed on absorbent paper. New to brown ink, I recently tried Diamine Rustic Brown. 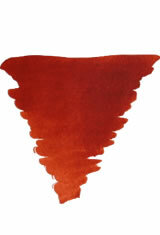 The ink provides a deep, rich brown color with a hint of red and orange. Some reviews noted that the color is very dark; in my opinion, it is dark, but in a rich way, where the brown is anything but flat. The ink flows very evenly and dries quickly, an advantage for left-hand writers like myself. I used the ink with a Nemonsine Fission with a fine nib.